Al Shirawi Contracting officials receive the certificate from Lloyd’s Register. 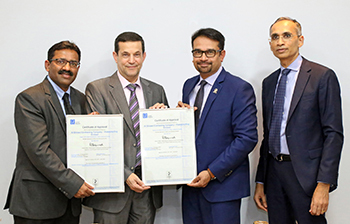 UAE-based Al Shirawi Contracting Company has become the first company in the country’s waterproofing segment to be successfully certified to the ISO 14001:2015 Environmental Management System (EMS) and ISO 45001 Occupational Health and Safety standards by Lloyd’s Register. A leading waterproofing specialist in the emirates, Al Shirawi says the dual distinction goes to show that the company is focused on enhancing its environmental performance as well as creating better, safer working conditions for its people. The compliance also means that its waterproofing solutions can meet the needs of sustainable buildings, it states. Al Shirawi Contracting Company already has one of the best safety standards in the country, with no major fatality reported in the last 10 years. It recorded 1.547 million safe man hours in 2018 alone. The ISO 45001 Occupational Health and Safety certification reiterates its commitment to protect its workforce and further reduce any workplace risks.